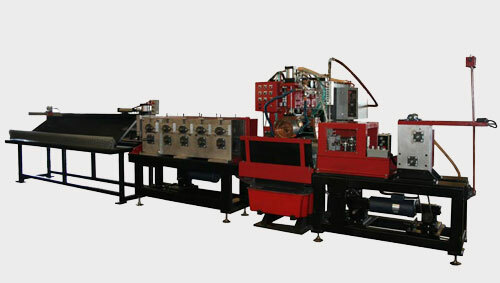 Wire Form Station: Is attached to seam welder and has its own regenerative drive motor, reducer, controller and encoder. Seam Welder Station: Employs two Janda heavy-duty Timken bearing weld heads, transformer and weld control. Entire secondary is water-cooled including weld transformer, SCR contactor, weld heads (both internal and external), plus four water jets are set to cool seam weld wheels and welded wire. Roll Former: This station will also have motor, reducer, regenerative SCR speed control, encoder and guards.